The Oak Hammock Marsh Interpretative Centre near Stonewall, Manitoba is situated along the edge of the marsh for prime viewing opportunities. Behind the tall green plant life flourishing in the marsh, the Oak Hammock Marsh Interpretative Centre in Manitoba, Canada is situated. Here visitors can partake in group tours, read information for themselves or enroll in the educational programs offered, some which include canoe adventures, snowshoe walks and hikes to explore the beauty of the marshlands. 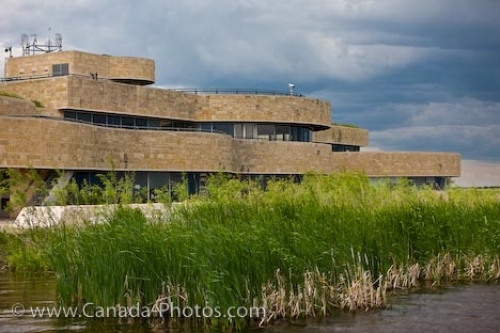 The building also offers visitors to the Oak Hammock Marsh Interpretive Centre a 120 seat multimedia theatre, a cafe, a gift shop, meeting rooms and a variety of interactive exhibits. The outside world around this intriguing building is home to 25 species of mammals, amphibians, reptiles, fish and at least 300 species of birds. Main visitor centre at Oak Hammock Marsh Interpretive Centre, near Stonewall, Manitoba, Canada. Picture of the Oak Hammock Marsh Interpretive Centre near Stonewall, Manitoba which was built along side of the marsh.